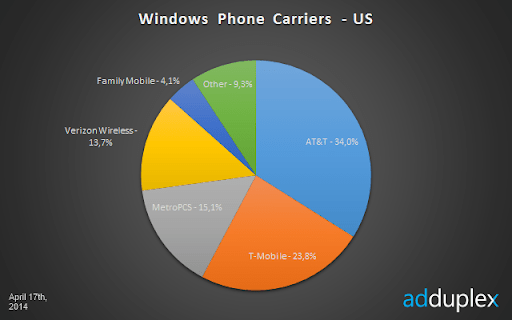 This report is based on data collected from 3886 Windows Phone apps running AdDuplex SDK v.2. The raw data analyzed was collected over the day of April 17th, 2014 (UTC time) unless otherwise stated. We have made every attempt to consolidate different reported phone model names under their canonical retail model names, but it is possible that some of the rare model name variations were not accounted for. This could very well be the first month since Lumia 520 release almost a year ago when it stopped growing. Theoretically, it even shrank a bit, but that could be attributed to statistical inaccuracy, rather than dramatic changes in the market. Same goes for the next 3 models in the Top-10. They swapped places, but they were (and are) pretty close to one another to make any conclusions. Having said that, it is clear that both Lumia 920 is at the end of its lifecycle, soon to be replaced by the new +10 sibling. So it’s quite possible that the remaining inventories are being sold at very competitive prices and that contributed to a sudden return of 920 to the second spot. The only other notable change is that Lumia 610 is finally out of the top and Lumia 925 is finally in. The same is true for the manufacturers chart. The numbers are basically identical to last month. 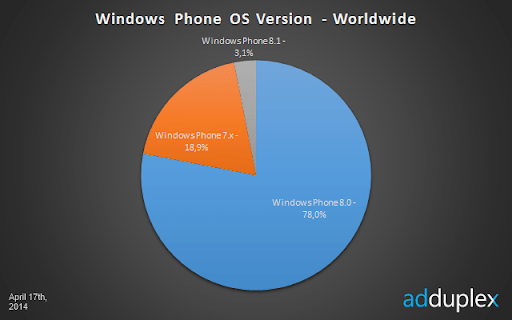 As you can see, 3.1% are already on Windows Phone 8.1 and since this sample was taken about a week after 8.1 became available to developers, we can assume that 3% represents the share of Windows Phone enthusiasts among the whole user base. Not much has changed in US either. The only change is that Lumia 900 continues on its path out. Verizon has regained a few decimal points in the carrier chart. Most likely, due to introduction of Lumia Icon, which sits at #18 in the US device chart. 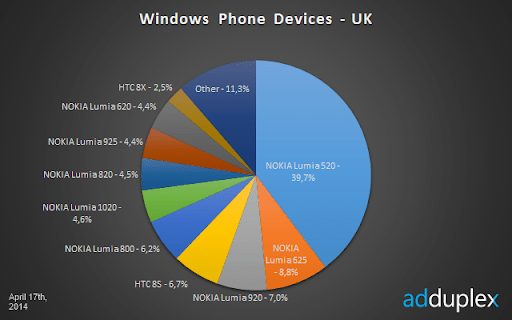 520 is still at the top of the UK chart, but Lumia 625, 920, 925 and 1020 all gained market share since we reviewed the country back in February. Lumia 1020 has actually moved from #10 to 6. 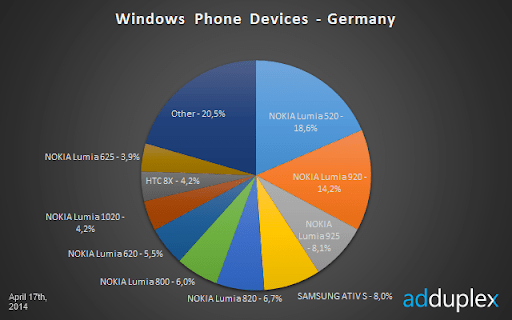 Our last look at Germany was in January and Lumia 520 has finally overtaken Lumia 920 for the top spot. 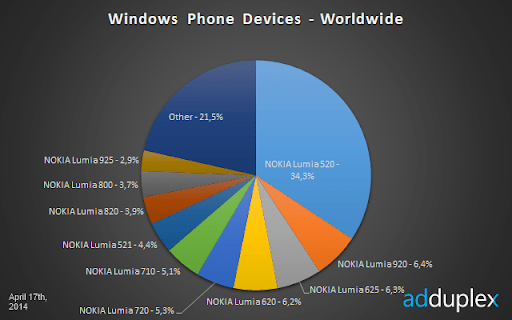 Lumia 925 has slipped past Lumia 820 and Samsung ATIV S for the third place. Lumia 625 has entered the TOP 10 and Lumia 1020 moved two steps up to #8. 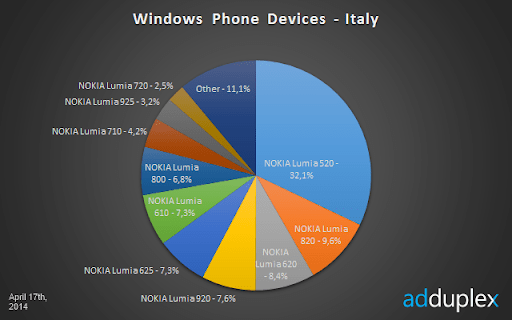 Italy continues to be one of the poster countries for Windows Phone and while things looked a little worrisome in the beginning of the WP8 cycle, we are now past the hurdle and the former longtime WP7 leader (Lumia 610) is only fifth now. Lumia 625 has moved past it and Lumia 800 since we last looked in January. 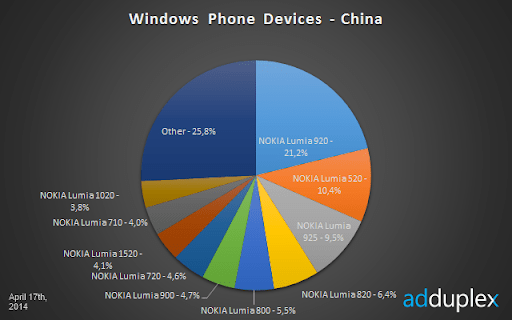 China is one of those odd markets where Windows Phone seems to be doing better on the hi-end than low-end. The top of the chart has not changed much in the last 2 months, but we now see Lumia 1520 at #8 and Lumia 1020 at #10. 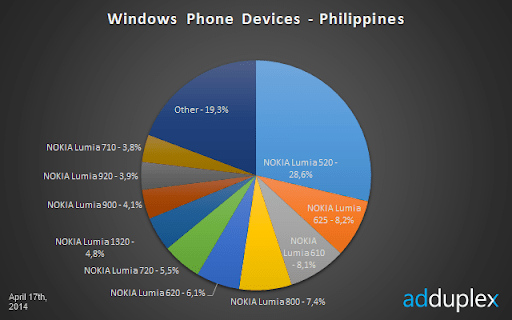 I don’t think we have covered Philippines before and it looks pretty much like a typical Windows Phone country. 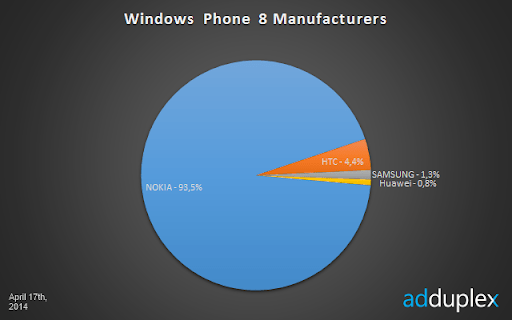 The only notable exception is the 7th spot and almost 5% held by Lumia 1320. 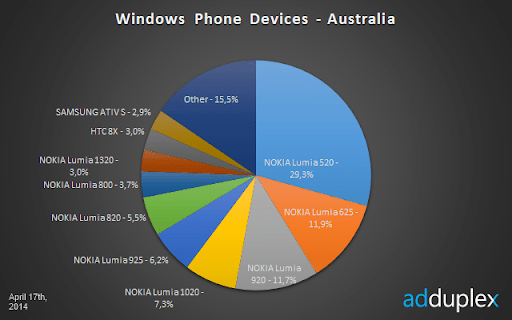 Lumia 520 is at the top in Australia. No surprises. Lumia 625 liquidated almost 5% deficit from L920 since January and claimed the second spot. 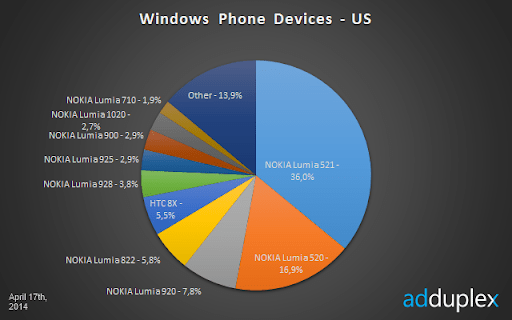 Lumia 1020 is at number 4 (was 5) and Lumia 1320 is 8th. 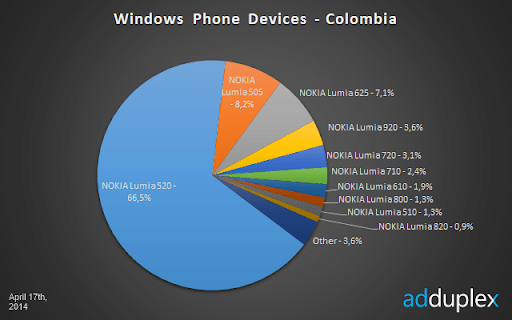 Another new country for this report is Colombia – one of the countries where Windows Phone is the second mobile OS. And it is basically owned by Lumia 520 with 2/3 of the whole Windows Phone market there. We’ve started seeing quite a bunch of Nokia RM-10xx models. We’ve covered RM-1010 last month. In addition to that, we have seen RM-1020 and 1027 both of the same lower-end 480×854 variety. Additionally we see quite a few RM-1045 phones. These are 1080p 5” devices and we see them so widely across the globe that the only conclusion we can come to is that this is the internal name for Lumia 930. That said, we would expect to find mentions of the model name for 930 somewhere on the web and a few quick searches for RM-1045 yielded nothing. No sign of Windows Phones from all the newly announced OEM partners so far. AdDuplex is the largest cross-promotion network for Windows Phone and Windows 8 apps empowering developers and publishers to promote their apps for free by helping each other. AdDuplex was established in January 2011 in Vilnius, Lithuania. As of April 2014, more than 7,500 apps actively use AdDuplex to gain more visibility.